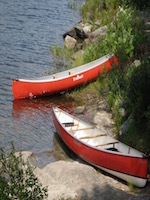 Canadian Canoe Routes • View topic - Spring has arrived! Post subject: Spring has arrived! Also a juvenile Bald eagle flying close to it. Post subject: Re: Spring has arrived! Spring will actually be here as soon as you give me (us) a heads up when it's a good time to run the Credit! Should happen fairly quicklyonce it warms up as most of the big ice went out a few weeks ago in that heavy rain, maybe not the flat water down in Port Credit though. This cold spell should ice up the river again but not as thick as before. Should be a very good runoff year if it is not one of those instant springs. Lots if water and ice mixed in with the snow. Was down at the PC river on Sunday, the open flats are still frozen over, but north of the 403 it was running pretty good. My guess is about 3 weeks she will be wide open. Especially if we hit the + temps their forecasting here on out. The daffodils are emerging here. I'm looking forward to the spring runs. Minus 15 this morning and the only moving water anywhere within 100km is a sliver of open North Saskatchewan flowing through Edmonton where the current is too strong to freeze. It may have arrived in southern Ontario, but here in the upper Ottawa Valley the snow is still waist deep and people can safely drive their vehicles on the ice to their fishing huts. It's going to take a long time to melt all that. It was -23 this morning, so I'm not holding my breath. I saw a few more turkey vultures in the area today! Doesn't mean we will be paddling soon down here either. Some will open faster than others due to the high amount of storm sewer runoff but with the week long cold snap the rapids froze up again and the flat areas are still solid. The Killdeers are backin Milton. Arrived under the cover of darkness tonight like they do every spring! We have our own issues here in Virginia, for sure. But it's mid-March and all the little rivers coming off the Blue Ridge and the Alleghenies are rolling, and the play boat scene has been great all winter (gotta love global warming). Potatoes are planted and already stacking next winter's wood. At night, the owls are quieter and the foxes are louder, and its time to worry about my damn chickens. Feeling the pressure to decide on a summer Quebec trip, but just can't settle on the river. Kinda between the Bazin and the Broadback. Either way, it'll be a good ride. Down in the tropics of Maine we have two feet of ice covered with snow ( and a foot on the ground)but who knows how safe it is.. It does have snow on it so the sun may not have candled the ice. May be risky for snowmachines. The skiing is still great.. Anyone who loves global warming is unaware how it plays havoc with the ocean ecosystem.. And yes frequent snows are an indicator of GW in the ocean here. Counting down the weeks till daff time. Its usually May 15.